Sober Look: Time for LTRO-III? In his weekly update on the ECB balance sheet, Kostas points out (among other developments) an increase in lending to banks (now at €1.24 trillion - a new record). Much of the increase comes form MRO - the ECB's main lending program. The bulk of these new loans likely represent the replacement of lost deposits at Spanish (and other periphery) banks as run on the banking system there continues. The first LTRO funding was put in place shortly after Mario Draghi became the head of the ECB. MRO levels were quite high at the time. 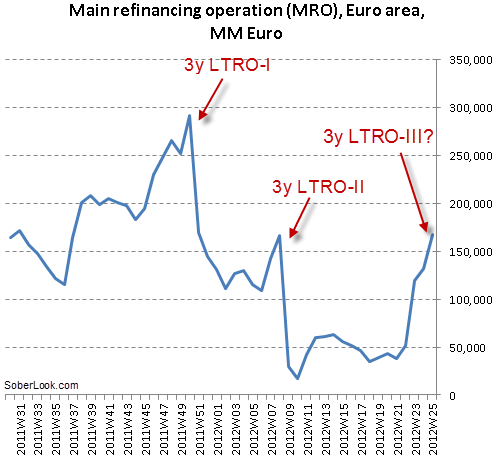 The 3-year LTRO programs Draghi put in place drove down MRO balances dramatically as banks rolled their short-term financing (MRO) into the long-term LTRO. Since the last LTRO funding however, the MRO amount has risen significantly, particularly in the past few weeks. It is now above the level it was prior to the last LTRO, indicating a sharp increase in demand for liquidity. That may be a signal for the ECB that it is time for a third round of LTRO in order to ease the tight liquidity conditions.